In preparation for the launch of our new comprehensive catalogue, Steon Lighting have introduced a new Urban and Flood Lighting range to their exterior lighting portfolio. Steon Lighting’s lighting design department have been busy designing schemes for clients using products from this new range. 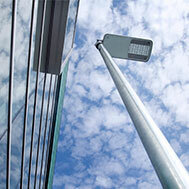 Some of our most popular Urban luminaires include the Bank LED, Shard LED and Condor LED. Steon Lighting have introduced a new Urban and Flood Lighting range to their exterior lighting portfolio.